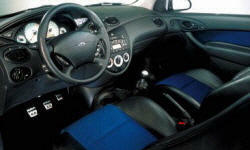 Why the 2003 Ford Focus? 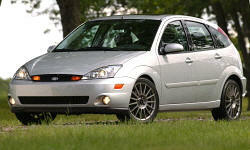 The Ford Focus SVT was perhaps the best-handling compact hatchback of its era. Precise, well-weighted, and communicative steering. Agile yet safe handling. The distinctive exterior styling isn't to everyone's taste. But to my eye there's not a line out of place with the egg-shaped hatchback. This generation of the Ford Focus is much more attractive than the chunkier one that followed it (which was no longer offered as a hatch). The 170-horsepower 2.0-liter engine is peaky, so you have to rev it. But do that and the SVT is quick, if not nearly as quick as later turbocharged hatches like the 2007+ MazdaSpeed3 and 2013+ Focus ST. The original Ford Focus actually had a roomier, more comfortable rear seat than the 2012+. The seat cushion is even high enough off the floor to provide adults with thigh support. Compared to the 2012+ Focus, the original had a less massive instrument panel and larger windows, so it was easier to see out of. Visibility was even better in the Protege5, though. Why Not the 2003 Ford Focus? The Focus SVT would have cost me about $5,000 more than the Mazda Protege5. At the time I considered buying a Focus SVT, I had a Ford Contour SE that had just suffered a major engine failure at 66,000 miles. Ford was not helpful. So instead of buying another Ford I bought a Mazda (which is essentially the Japanese subsidiary of Ford). I wasn't personally very focused on fuel economy, but the SVT wasn't very fuel efficient for a fairly light car with a normally-aspirated 2.0-liter engine. The original EPA ratings were 21 mpg city, 25 mpg highway. Using the 2008+ adjustments, they'd be 18/23 if the car was available today. Back in 2003 I really wanted a Focus SVT. As I update this review in 2012 I'd still like to have one. They were attractive, fun-to-drive cars. But at the time I'd just had a bad personal experience with a Ford, and the Mazda was much cheaper.